We met for a big bike ride at the usual coffee spot. After a quick mug o' joe on this cool morning, we rode out towards Sackville to pick up the number 1 highway (Evangeline Trail). The goal was to keep riding on the number 1 as well as do some exploring. With no particular destination in mind, Jason and Kelsow's goal was to search of a camping spot for the night. We stopped into Valley Yamaha-Suzuki for a chat with Bruce. We talked bikes n' boots for a while and then continued on our way. 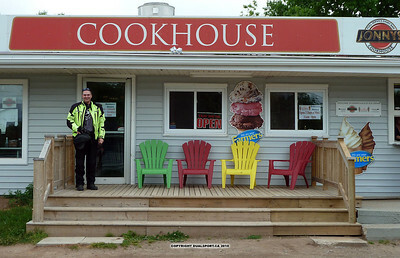 Our resident Newfoundlander had to stop at Jonny's Cookhouse in Berwick for a Newfoundland feed of fries, dressing (a.k.a. 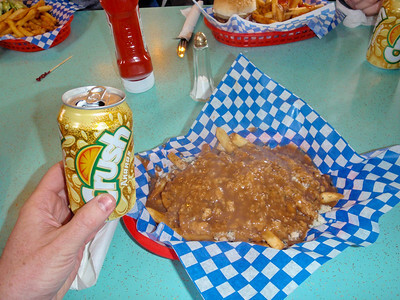 'stuffing' on the mainland) and gravy and a Pineapple Crush! Some shockin' good, wha? 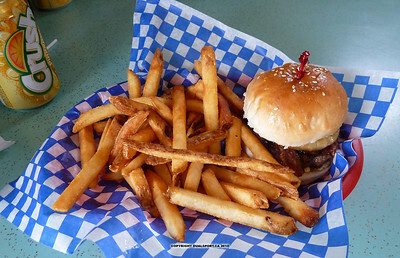 If you're in the area, stop in for some delicious grub. 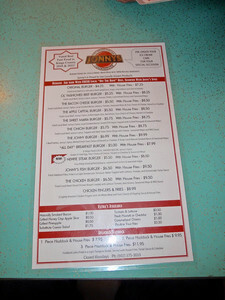 Jonny, the owner, is from Stephenville and will treat you to a wonderful scoff. With our bellies full, we sped off so as not to fall into a gravy coma. 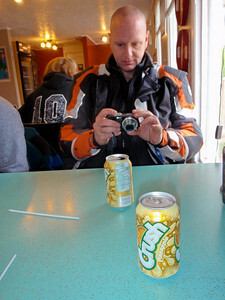 We did some more exploring and some of the guys fueled up in Kingston. 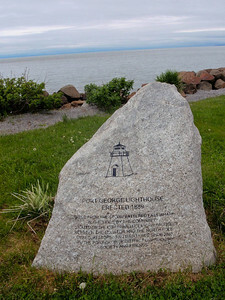 From there, we decided to go up North Mountain towards Margaretsville and Port George. We stopped at the lighthouse and spotted 7 or 8 groundhogs, but no sign of Bill Murray. It was at that time that Eric and Goalie decided to venture back home. We said our goodbyes and decided to focus on finding a camping spot for the night. We had no interest of going to a camping park - we wanted somewhere on the ocean for the low, low price of 'nada'. 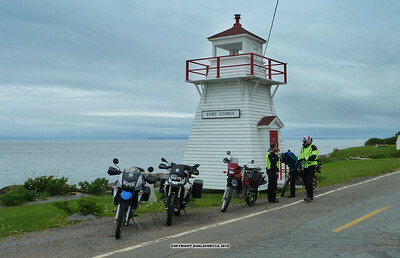 We picked up a dirt road that led us right to the Bay of Fundy just outside of Port George. It was a great spot to set up camp with a grassy area for the tents and plenty of driftwood for a fire...but, it was only 3 o'clock and much too early to call it a day. We set a way point on the GPS and decided to ride for at least 3 more hours and if we couldn't find a better spot, we'd double back. We stopped in Hampton and rode down to the wharf. 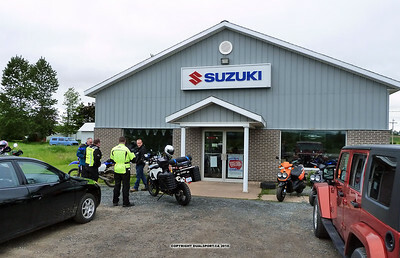 We chatted with some Harley dudes and they told us we could take the mountain road in Parkersville to get to Annapolis Royal to pick up supplies. We rode around the town but couldn't find the NSLC. Jason suggested that it should be near the grocery stores. He also uses a GPS (Guinness Positioning System). Embarrassed though, we asked a store clerk where the NSLC was only to have them point across the street. We blame the gravy coma. 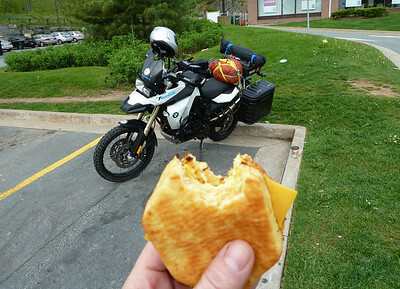 With our panniers full of FBT's (fat boy treats) and suds, we headed in search of a camping spot. We did find an old road with a "Bridge out" sign. 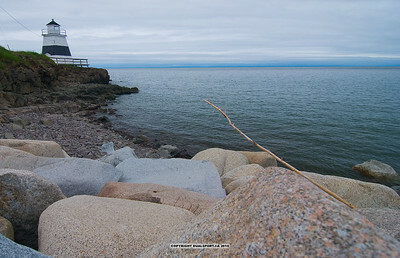 Not really knowing what was on the other side of the washout (and with the flies as thick as pea soup), we decided to head back to Port George to camp at our ocean location. Upon arrival, we spotted two baby car seats and several phallic drawings in the dirt. This could only mean one thing and we don't know what that is. It turns out it was the makings of a large party of teens setting up camp for the night. Thankfully, they stayed up in the field quite a distance away from our location. They thought we were the fuzz and told us they'd keep it down for the night. Yeah, whatever Bieber-clonez! We opened our panniers and came to the sad realization that two of our beers had ruptured (raptured?) from taking a beating over the previous dirt road. After a moment of silence, we tore into the remaining ones. There's nothing like watching the sun set over the ocean while drinking warm beer. Good times indeed. Kelsow's ultra-fast-jet-fuel-powered-cooks-your-mr-noodles-wicked-fast camping stove had him full in minutes while he mocked Jason for his cheap n' cheerful stove that took quite some time to heat soup. What a perfect time to get the fire going while the soup simmers to a boil. After telling lies until 1:00 am, we crashed into our tents for the night. It was a cold one the next morning when we arose shortly after 6:00 am. We wasted no time in getting packed up and headed straight towards Middleton as Jason needed fuel. We fueled up on gas and coffee and decided to take the number 10 over to Bridgewater and ride the number 3 back into town. We did some exploring off the number 10 and found several dirt roads that looped back on the number 10, including some of the old railway bed. 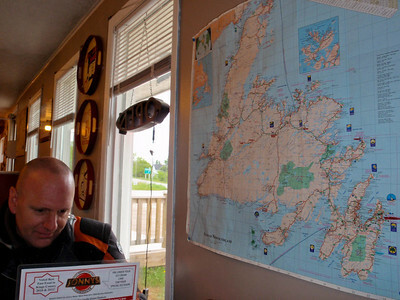 Once we got into Bridgewater, we stayed on the number 3 and decided to head to GB's for a visit. He wasn't home but arrived shortly after we did. The great guy that he is, he offered us Blue Star! What a perfect way to end a ride!